The traffic along the North South Highway was not too congested considering that it was the weekend of the Deepa-Raya celebrations. We arrived in good time and found the family deep in preparation for a children's party. No special occasion, just because. The house was, as usual, quite messy and very noisy ( a fourth dog has temporarily joined the household) but the tables were set with nice linens, the balloons blown, glasses polished, and a colourful buffet spread prepared by third sister, aunt L and the domestics. There was a little panic when third sister asked second sister where was the cupcakes, what cupcakes asked second sis, you know the cupcakes you said you will bring for the party, no, said second sis, I said I can give you the recipe..... no problem, second sister whipped some cupcakes up in a jiffy and we set about decorating them with icing and colourful sprinkles. The children had a blast. Mostly three and four year olds, they were happy playing with plastic cars and pommelling each other with balloons. In between, we ate mincepies, cupcakes, croquettes, pizza and (this are for the adults really) seafood canapes. The mini nasi lemak packets were a bit hit. Bite sized portions of rice with quail eggs, peanuts, ikan bilis and a killer sambal. Later in the night, I was hungry for some and rummaged around but couldn't find the leftovers. The carrot cakes were a bit harder than usual, think third sister added too much of something. Sister-in-law spent almost an hour carefully making them colourful sandwiches. Foods washed down with some sauvignon blanc and fresh watermelon juice. Mummy made a big pot of pig stomach soup too. The stock base was made with stacks of pork ribs, and instead of white pepper, she used the more pungent and earthy black pepper, so the resultant concoction was really flavourful. The pig stomach was prewashed by the butcher with plenty of dried tamarind peel and salt, and before cooking, Mummy turned it inside out and rinsed it out twice more with more salt and boiling water, just to completely clean it out and remove any offensive odours. To finish, there were party packs loaded with more confectionaries and toys- mini trucks for boys and puzzle packs for girls. Something for the kids and adults too. Will be in KL for the next few days. Posting will depend on my mood and availability of internet access. Happy Deepavali and Selamat Hari Raya Aidil Fitri to all of you out there. 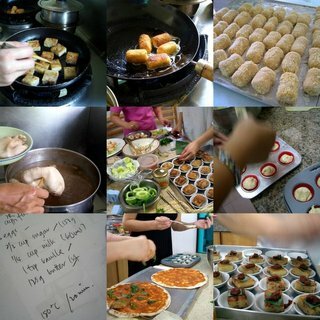 Looking through all the Malaysian food bloggers pictures of bazaar Ramadhan pictures left me quite homesick. A good thing then, that Johor Bahru is only an hour's drive away. Had initially wanted to revisit the bazaar we went to two years back, but we couldn't remember where it was, so decided to drive up and try our luck. First, some lunch. Husband consulted his food guide and he seemed to know what he was doing so I continued reading my book (sent to me by my friend in Sydney, thanks Cath!). We ended up at the W W Laksa at Kampung Nong Chik. Thick laksa gravy made with more spice paste than dried shrimps was very lemak and packed plenty of oomph!, and there were generous bits of fried wonton skin and taupok to soak up all that gravy. The only critiscm was that I could not help wishing for a bit of tart kaffir lime juice to relieve all the richness. Our destination was Plaza Angsana, but there was a little bazaar right there in Kampung Nong Chik so we checked it out first. Everything looked good so we bought some and ate them in the car. Because there weren't any tables or chairs around and I was thinking it would seem insensitive to eat in full view of the fasting local folks. Left: Nasi Ambang, a local specialty. We enjoyed this. Rice with chicken in a mildly spicy tomato sauce, some sambal tumis, stir-fried beans in a korma sauce, spicy dried coconut floss, spaghetti (quite incongruous, maybe it was there for texture) and the deal breaker, at least for me, was a piece of fish that at first reminded me of an overgrown ikan bilis. The fish, salted and fried, added depth and contrast in flavours to the mix and united the disparate elements together harmoniously. Right: Epok-epoks of sardine and chicken, kueh dadar, jemput jemput pisang, etc. Not very interesting, I've had better versions before. There was indeed a bazaar of sorts at the Angsana shopping mall, but it was peddling cookies and soft drinks. We drove a little further along and saw some makeshift tents near the Giant supermarket. Love the roadsign. Left: Charcoal grilled spiced chicken. The spice rub was fantastic, not too sweet so the spices can be tasted, and marinated long enough so that the flavours permeated right down to the bones. Cooked until the skin charred but the meat remained juicy. This stall is fe-mes, they appeared in the Chinese press only a week ago, so the owner informed me. 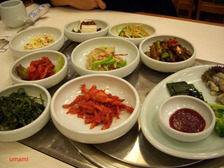 Middle: Cooked dishes for people too busy to cook. Right: Colourful drinks, mostly sugar water and colouring. Left: A seasonal kueh of baked coconut custard, I think it is called akok. The inside of quivery caramelly custard a surprise contrast to the thin eggy skin. Enak, I said. The owner beamed with pride and pleasure when I told him so. Middle: Hot dogs and chocolate with coloured sprinkles. Strictly for kids and people who cannot bear to choose between a chocolate donut and a hot dog bun. Left: A new type of kueh, didn't get round to trying it out. Unlike bazaar ramadhans in Singapore, here there wasn't a Ramly burger stall in sight. Most foods were made from scratch, and with a lot of heart. The fried noodles dished out by the young men were surprisingly fragrant with wok-hei. A little boy was cooking Roti Jala, his brows and lips furrowed in concentration to make the most pretty pancake he could, scraping tidily away the excess batter in between batches, his father packing the fresh-out-of-griddle piece for me (instead of taking one from the cooling pile) without my needing to ask. At the Nasi Beriani Safiah Razak (012-7007465) stall, I noted that there was less than half a pot of rice left even though the bazaar will not close until 3 hours later. Didn't take a chance, bought mine early. Madam Safiah's briyani is fragrant and the accompanying chicken shiok-ingly good. We ate some more in the car, then went shopping at Giant. Or rather, walking, because things at Giant seemed more expensive than what we pay in Singapore. The promoters were out in full force, there was breakfast cereals, vegetarian chicken nuggets, yoghurt drinks and Ribena. Yes, Ribena, perfectly mixed and served icy cold in a paper cup, not those tiny plastic medicine dispenser thingies. I ask you, which household in Malaysia and Singapore doesn't have a bottle of Ribena in their fridge? Needles to say the girls at the Ribena stall were kept busy handing out samples. Old and young, male and female, nobody said no, kids and adults alike went back for extra helpingss, which the Ribena girls gave out just as cheerfully. This kind of activity generates a lot of goodwill and strengthens their brand recognition factor, sure beats spending millions on more expensive TV and print advertisements. I have not eaten anything terribly interesting the past weeks, hence the total blog funk. Wish I am in Malaysia instead, where fellow food bloggers are going camera-crazy with all sorts of festive goodies at the various ramadhan bazaars happening all over the country.